Happy Monday! Christmas is fast approaching… whether you are ready for it or not (like us). We are knee deep in renovations and projects at our new house, but we have set a date to be complete with majority of the bigger projects soon so we can get all of our Christmas decorations out and in place for the season. 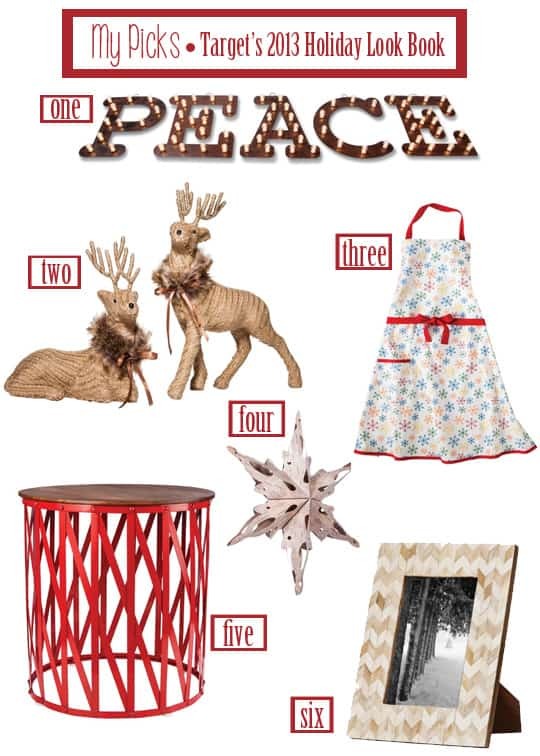 In the meantime, I thought you might enjoy a preview of some of my favorite picks from Target’s Holiday Collection 2013. 1/ This peace marquee sign is on the top of my wish list. I absolutely have to have it! It would go great with our new furniture and look we have in our home! I have several places I could put it! It’s a must! 2/ I also really like this burlap deer. I think they would look adorable under the tree or on a mantel with fake snow! 3/ I am a quirky kind of gal. I love things like holiday socks & drinking coffee out of a holiday mug when the season approaches. I love the idea of having a Christmas apron for a baking session! Isn’t it cute? 4/ Last week, at one of my many Target stops, I ran through the Christmas section to get a sneak peek as they were setting up. I loved the decorated tree in the middle… it was filled with large ornaments and these paper snowflakes. There weren’t any out yet for purchase, but these are on my list too! 5/ How much fun is this red metal table? I think it would be so fun to have a neutral Christmas color pallet and add one pop of red… wouldn’t that be so pretty?! 6/ It’s no secret that I am still in love with chevron and herringbone patterns. (I actually just purchased a pair of chevron drapes for our new home office about a month ago— blog post coming). I love the idea of having our Christmas photo in this fun and neutral frame. Plus, it’s something you can use it all year! So, let’s hear it… do you have any favorites? Are you all decorated? Waiting until after Thanksgiving? Do tell… come on and share! P.S. I didn’t get paid or perked for this post… I love Target and thought it might be fun to share some of my favorite things from the newest holiday look book! Not all of the items are available yet online, but may be found in your store!